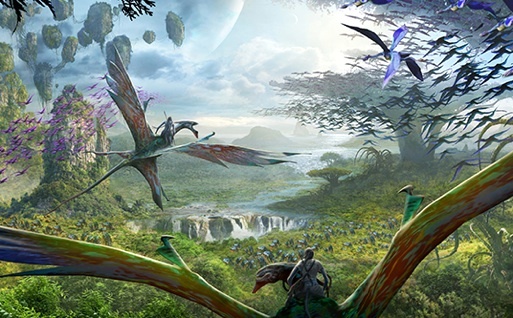 November 30, 2013, 11:41 AM · Despite what you might have heard about Disney's future theme park attraction plans, the Avatar "World of Pandora" land at Disney's Animal Kingdom at the Walt Disney World Resort remains good to go, and we've seen the plans that prove it. Disney's scheduled the first phase of Pandora to open in 2017, and based on the designs we've seen, we believe that phase will include the "Soarin'"-style 3D movie attraction. Design plans for that attraction call for a massive, five- or six-story theater building, which will top out somewhere around 80 feet. The building will include four show theaters, which will radiate from a central hub from where visitors will load into the theaters. Two of the four theaters will be ADA-compatible (more about that in a minute), and plans show three ride levels in the show building. The indoor portion of the queue will snake through a shorter building to the side of the main theater building. Just as the queue enters the theater building, the queue will split, and visitors will be sent onto one of two ramps. The left ramp will descend slightly to the first show level, while the right ramp will ascend to the second show level. On each level, groupers will split their portion of the queue into four groups, to load each of the four theaters. Once directed to their theater, visitors will pick up their 3D glasses before entering a small pre-show room. From there, visitors will walk through a load vestibule before emerging into their theater. It appears that some of the visitors sent to the second show level will ascend to a third show level after they've been assigned their theater and picked up their glasses. Although this attraction's been compared widely to Soarin', the load procedure implied by these blueprints would be compared better with Universal's The Simpsons Ride. On Soarin', everyone enters the theaters on one level, to board ride vehicles that then ascend to one of three show levels. On Simpsons and on Avatar, visitors will walk up ramps or steps to their ride level, although the ride vehicles may further elevate from those levels. Visitors will face curved IMAX-style screens during the show, then will exit through one of two unload vestibules. The plans show visitors on the second and third show levels descending stairs to exit the building, so I presume that all wheelchairs parties will be sent to the first show level to board the attraction. In addition, the two ADA-compatible theaters exit the building at that first show level, while visitors from the two other theaters descend one more floor in their unload vestibule down to an exit corridor that crosses underneath the theater building, so that all four theaters can exit on the same side of the building. I don't think anyone needs three guesses to figure out that's so all riders can exit into the attraction's gift shop. What we don't know from these plans are what the ride vehicles will look like, though the plans suggest that they will be suspended from the building's ceiling. Nor, of course, do we know anything about the setting or storyline of the movie itself, beyond what Disney announced at the D23 Expo in Japan — that visitors would fly through the skies of Pandora. However, with four theaters and IMAX-style screens, we do know that this will be one massive show building. November 30, 2013 at 1:58 PM · I really hope that they come up with some creative/ fresh ideas for this attraction. The "flying over a spectacular landscape"-simulator has been done many times. That's also why I'm not really excited about this new ride. But hopefully they will prove me wrong! November 30, 2013 at 3:22 PM · Basically, it is the Simpsons with a bit more movement and maybe your feet will dangle? Where has Dominick been, he usually complains about 3D movie rides? November 30, 2013 at 11:00 PM · Soarin 2 sounds much more interesting. Id rather fly over actual video footage than CG. Can't see myself booking a trip to Florida for a 3D movie that moves. But hey this is years in the future so we'll see then. December 1, 2013 at 12:17 AM · So they are definitely going with 3D? I remember the last time imaginering was talking about the Sourin ride they still weren't sure if it would be 3D (what was stunning to me because it's the only reason the movie became a success). Can't wait to actually see these blueprints. December 1, 2013 at 6:16 AM · Wish and you shall receive NB ;) I'm not against 3D rides, just that Universal needs to make a ride without 3D. Considering this will be an inverted Soarin' I'm all for it. December 1, 2013 at 8:22 AM · I'm looking forward to this. I know it's just a simulator, but everyone I've taken on Soarin for the first time are pretty blown away (despite the dirty lenses). This takes it up a notch and if it's as "realistic" as Soarin, I really think people are going to love it. My only question is that if it's in a 6-story building, what will the building's facade look like? Because that's a huge building, and it's not going to look like a mountain, I'm pretty certain. December 1, 2013 at 5:23 PM · Dominick.... you've been a ghost lately. I miss our friendly debates. Good to see you back. December 2, 2013 at 3:23 PM · Awesome! I love this idea! December 2, 2013 at 3:28 PM · This ride should benefit from the same system of rotating storylines as the current version of Star Tours. I'm sure the 3D visuals will be impressive, but after Star Tours 2.0, it might be a bit of a letdown if the storyline is always the same. December 4, 2013 at 12:56 AM · Investing in complicated and massive showbuilding construction activities, instead of investing in original mindmoving imagineering. December 4, 2013 at 5:16 PM · This sounds awfully familiar to the leaked info from Stitch Kingdom/WDW FanBoys posted last year. The only new bits are the confirmation of 3d and ADA compliant. Too bad the real E Ticket for this area was nixed and we have to pimp up this rides status as a "wannabe E".